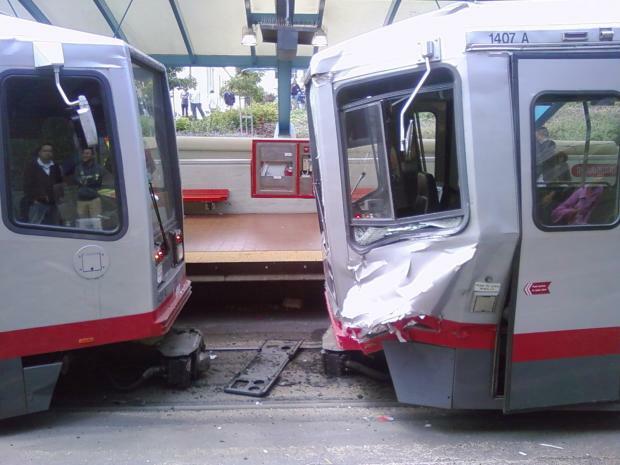 A crash between two Muni cars July 18 injured nearly 50 people. Despite assurances from San Francisco Municipal Railway officials, testimony at a public hearing in San Francisco today showed some residents consider public transportation in the city unsafe. Testimony before a Board of Supervisors committee hearing on two recent Muni accidents that injured dozens included one of the victim's of an Aug. 3 streetcar accident and another man who said he was on the streetcar at the time. 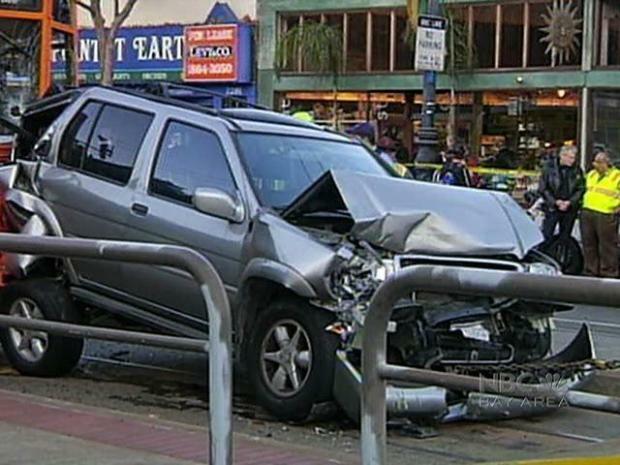 "It was a very frightening experience to be in that car," said Chris Ward, a Castro District resident who was driving his SUV at Market and Noe streets late that afternoon. 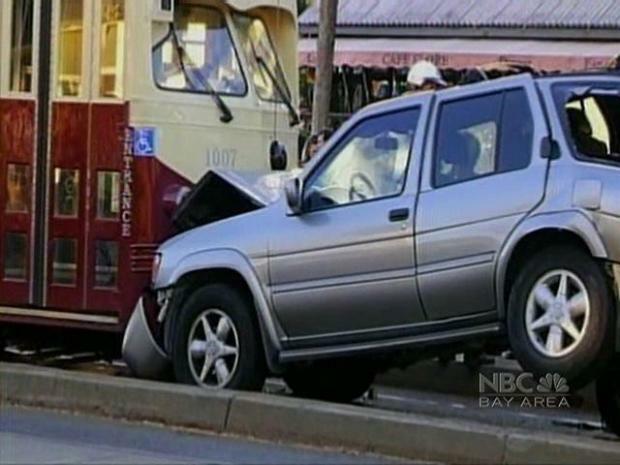 He ended up sandwiched between two Muni streetcars after one failed to stop and plowed into his car. Ward and his partner, who was in the car with him, were both hospitalized but released later that night. Four others were also injured, including the driver of the streetcar that struck Ward's car. Six people were injured Monday in a collision between two SF Mun trains and an SUV, just weeks after another Muni collision sent dozens to the hospital. "I miss my car, but accidents do happen," Ward said. What was most irritating, he said, was "that there appeared to have been some negligence." "I think that our system needs to be run safely," Ward said. Muni officials insisted that safety was the agency's "number one priority," and cited statistics that showed a decrease in the number of Muni collisions in the past year. "We're looking certainly for a safer Muni," said SFMTA Safety Director Jim Dougherty, hired by the agency this February to fill the position, which had been open for 18 months. "There is never an acceptable accident. There is never an acceptable injury," Dougherty said. Muni is still conducting an investigation into the Aug. 3 crash, though officials have said a witness claimed the streetcar operator had been distracted at the time. The agency said the operator began braking only 14 feet before impact, and that there appeared to have been no brake or other mechanical failure. Muni also said the operator did not follow its rule requiring at least 250 feet between streetcars. Dougherty called the accident "very, very unfortunate." Supervisor Bevan Dufty, who initiated today's hearing, said it was lucky no one died or was critically injured. Norman Tanner, an outreach coordinator for the San Francisco AIDS Foundation, told supervisors today that he had been on the streetcar that struck the SUV but had only spoken with the driver five to 10 minutes before the crash, and then returned to his seat. "I know that he was not talking to no one (at the time of the crash), and I do not understand how he was distracted," Tanner said. Tanner told reporters that he came to the hearing "to set the record straight." However, when asked if he thought Muni was safe, Tanner responded, "No." In addition to overcrowding, "they raised the fare and cut the services," he said. Dufty said the crash, and another, more serious incident on July 18 in which a Muni train struck the rear of a second train at the West Portal Station, injuring nearly 50 people, appeared "avoidable" and "raised questions about the direction of Muni's safety program." Still, Dufty lauded Dougherty's "skill set and commitment since he's been on the job." Though a federal investigation into the West Portal crash will likely not be completed for several months, the Muni train operator has reportedly told investigators he blacked out moments before the crash. But the investigation has also determined that the train had been switched from automatic to manual before the crash, against Muni procedure. Muni is now citing operators going to manual without prior authorization from the agency's Central Control. Union officials have said it had been common practice for Muni train operators to go to manual in order to speed up on-time performance. "We are not emphasizing on-time performance versus safety," SFMTA Director Nathaniel Ford insisted last week. "For me, it's a bigger issue than just two accidents," Supervisor Chris Daly said today. He cited insufficient public oversight over Muni, and recent service cuts and fare increases implemented to help make up the agency's massive budget deficit. "Now you gotta pay $2 to get into an accident on Muni," Daly quipped. "Mine was free," Ward later responded. "We have a broken transportation system," said Daly. "Muni is not working to anyone's standards." Georgetta Gregory, who manages the consumer protection and safety division of the California Public Utilities Commission, told the supervisors that Muni has made "substantial accomplishments" in the past three years. "SFMTA has recognized the urgency of promoting a safety culture," she said. That includes encouraging Muni employees to report safety issues "without fear of reprisal," she said. Gregory highlighted improvements to Muni track conditions and record keeping, quicker completion of accident investigations, and safety improvements such as cameras in buses and signal improvements at 4th and King streets, the site of another light-rail injury crash in June 2008. Gregory said she has assigned three full-time engineers to oversee Muni safety operations, in contrast to the one engineer that is normally assigned to each transit agency. "Three years ago to today, it is a stark improvement," Gregory said. Other recent safety improvements include the addition of more Muni street supervisors, retraining for drivers, and public safety campaigns, Dougherty noted. One SFMTA poster showing a woman with headphones crossing in front on an oncoming Muni train bears the words, "Do you want Beethoven to be the last thing you hear?" An updated Muni rail rulebook for operators is planned for September, and one for bus drivers for the end of the year, Dougherty said. Also in effect is stricter enforcement of rule violations by Muni employees. Muni has had 231 disciplinary cases involving transit operators in the fiscal year 2008-09 resulting in 217 suspensions and 14 firings, the agency reported today.